Das Positionspapier der wissenschaftlichen Informatikvereine verlangt einerseits "digital literacy", worunter die effiziente aber auch ethisch korrekte und reflektierte Nutzung von digitalen Werkzeugen verstanden wird und andererseits "informatics", d.h. die Grundlagen der wissenschaftlichen Disziplin Informatik für die Schulstufen K-12. Laut den Autoren sollte digital literacy bis zum Alter von 12 Jahren abgeschlossen sein. This report was developed by a group of experts from academia and industry representing the two principal scientific societies in the field, Informatics Europe and ACM Europe, and covering a broad range of disciplines, experiences and countries. It builds on the considerable body of educational research and experimentation on digital literacy and informatics education developed over the past decades in Europe, the US and elsewhere. The report defines a blueprint for digital literacy and informatics curricula adapted to the European context, and explains why such curricula are critical to the economic health of European countries. Developing precise curricula is beyond the scope of the report; it is expected that, based on the report’s recommendation, specific curricula will be developed, taking into account the specific constraints of individual countries. All of Europe’s citizens need to be educated in both digital literacy and informatics. Digital literacy covers fluency with computer tools and the Internet. Informatics covers the science behind information technology. Informatics is a distinct science, characterized by its own concepts, methods, body of knowledge and open issues. It has emerged, in a role similar to that of mathematics, as a cross-discipline field underlying today’s scientific, engineering and economic progress. Informatics is a major enabler of technology innovation, the principal resource for Europe’s drive to become an information society, and the key to the future of Europe’s economy. European countries are making good progress in including digital literacy in the curriculum. The teaching of this topic should emphasize the proper use of information technology resources and cover matters of ethics such as privacy and plagiarism. 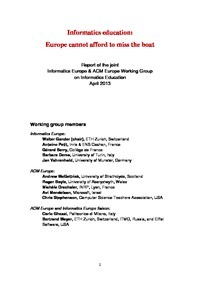 Informatics education, unlike digital literacy education, is sorely lacking in most European countries. The situation has paradoxically worsened since the 70s and 80s. Not offering appropriate informatics education means that Europe is harming its new generation of citizens, educationally and economically. Unless Europe takes resolute steps to change that situation, it will turn into a mere consumer of information technology and miss its goal of being a major player. Recommendation 1. All students should benefit from education in digital literacy, starting from an early age and mastering the basic concepts by age 12. Digital literacy education should emphasize not only skills but also the principles and practices of using them effectively and ethically. Recommendation 2. All students should benefit from education in informatics as an independent scientific subject, studied both for its intrinsic intellectual and educational value and for its applications to other disciplines. Recommendation 3. A large-scale teacher training program should urgently be started. To bootstrap the process in the short term, creative solutions should be developed involving school teachers paired with experts from academia and industry. Recommendation 4. The definition of informatics curricula should rely on the considerable body of existing work on the topic and the specific recommendations of the present report (section 4). The report is concise and makes strong points, emphasizing in particular the need to distinguish education in informatics from a mere training in digital literacy (the mastery of basic IT tools, the Web etc.). The distinction is often lost on the general public and decision-makers (and we will surely have to emphasize it again and again).